Hello, lovely friends! I have lots of gorgeous pictures for you. I hope you'll forgive my absence as of late. I'm not sure what my problem is, but I know I've been feeling stressed with new responsibilities at work. I also had family visit recently, which kept me preoccupied for about a week. My nieces are too cute for words, by the way! 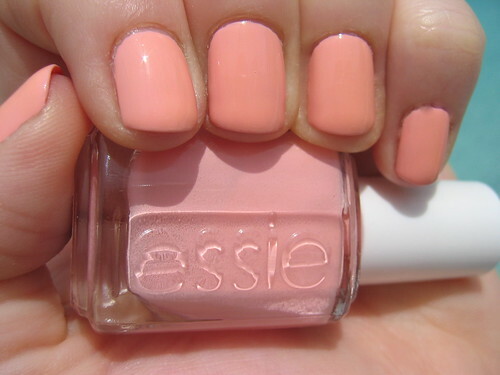 This is my nail-of-the-day, Essie Van d'Go. I did three coats, just to be safe. I probably could have gotten away with two. I really like this. It feels light and refreshing, like a break for me from what I usually wear. I don't generally adore creams, but I do love this. It's so soft and pretty but not entirely girly and frilly. 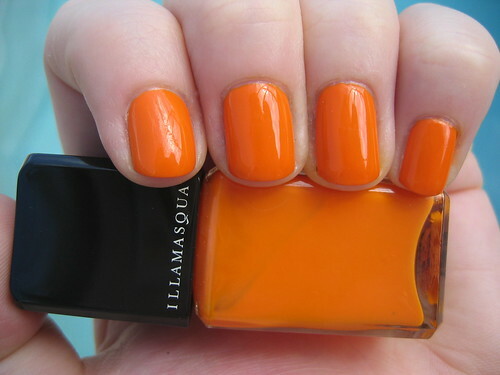 Below is Illamasqua Insanity, three coats. It's pretty insane, yup. It's not quite traffic cone orange, but it does demand attention. It's fun and funky. I got a lot of compliments on it the day I wore it. It's a UK exclusive color, unfortunately for those of us who live elsewhere. 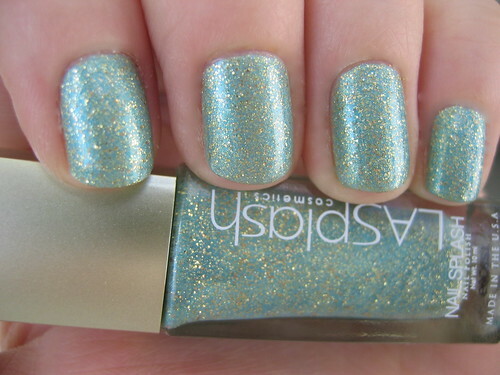 I adore the next polish, Nubar Violet Sparkle. It's so freaking stunning and fabulous! Three coats of luscious, purple, sparkly, dreamy goodness. It's a bit warmer and more red in real life. The pictures are faking it out, making it look more blue-toned. 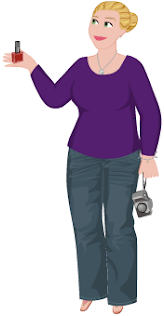 Silly purple! Ohhhh here's another winning fantabulous Nubar purple, Hyacinth Sparkle. Three coats. What's not to love? I highly recommend the entire Sparkle collection from Nubar. I wore a few others and neglected to photo them, but I will make a point to swatch them soon. They are terrific!! Here's yet another fun one, Nubar Gem, three coats. Three coats of NYX Girls Fig, an ambiguous vampy beaut! It's more purply/blue/gray in real life, but still very dark and naughty. Three coats of L.A. 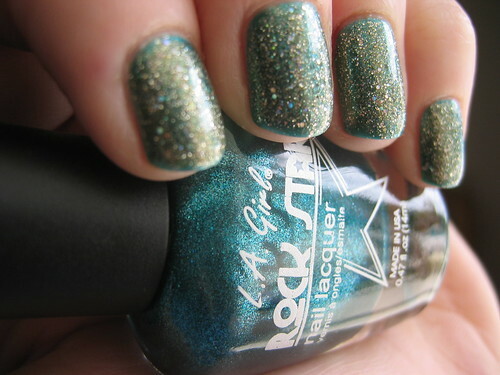 Girl Rockstar Head Banging with one coat of L.A. Girl Rockstar Live on Stage. 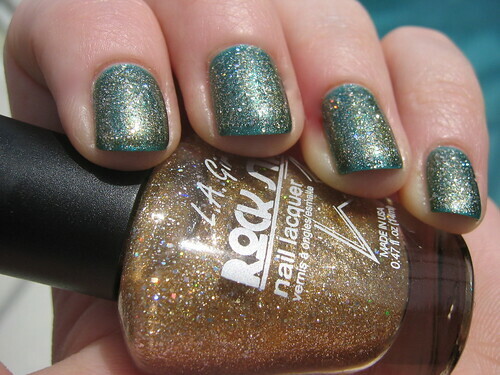 This is three coats of LA Splash Golden Seahorse. Lovely, no? 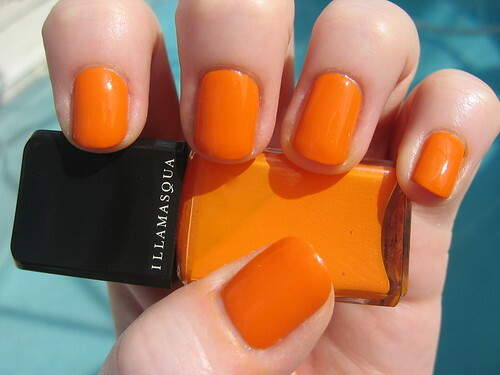 Illamasqua Nudge, two coats, with two coats of Rococo Gold Leaf Lacquer. So much fun! 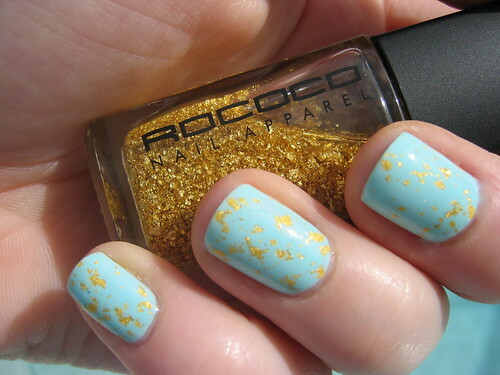 I heart my Rococo Gold Leaf Lacquer so much...and it's so toxic stinky, just so ya know. 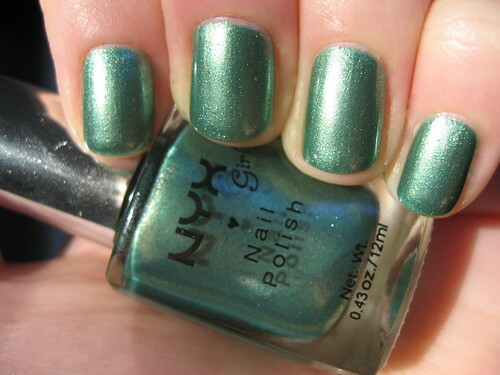 And last, but not least, is NYX Girls Boho, two coats. 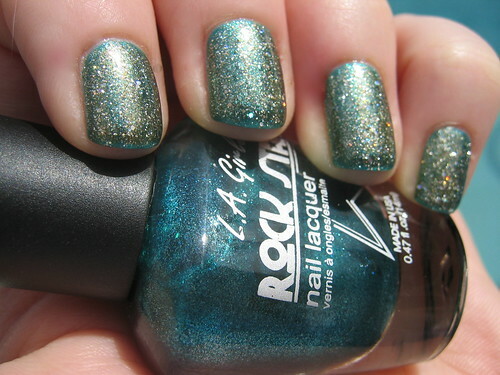 This is a gorgeous soft, cool green, with a metallic sort of shimmer. Hello Dizzy, Its yer Anonymous KUP :)That is ALOT of hottness. BEEEEEEEUUUUTIIFULL!@!@! The blue and gold combos look really great (esp. 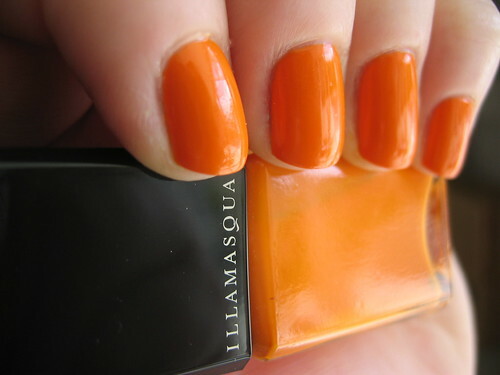 the rococo with the llamasqua). That particular combination always reminds me of Marie Antoinette--I think her furniture at Versailles was mid-tone baby blue with gold patterns. 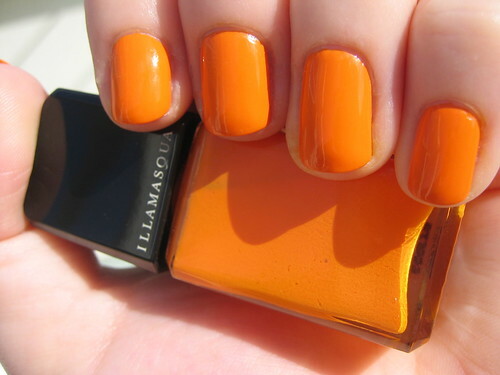 Very lovely swatches! Van d'Go looks beautiful- now I want it even more!